(1:35 p.m. EDT) -- The Court of Appeal has ruled that 16 British cruise passengers who fell ill onboard Fred. 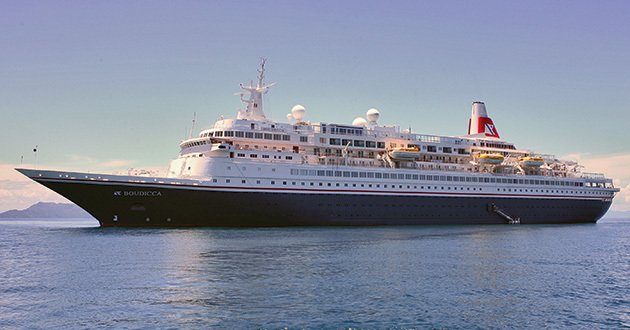 Olsen Cruise Lines' Boudicca in 2011 are entitled to compensation, after appeal judges uphold the original trial judge's decision. The 856-passenger ship was struck down with norovirus, which includes symptoms of vomiting and diarrhoea, during a cruise to the Canary Islands, Cape Verde and the Iberian Peninsula in March and April 2011. The passengers are now set to receive a settlement after the Court of Appeal -- led by Lord Justice Gross, Master of the Rolls Lord Dyson and Lord Justice Christopher Clarke -- rejected an appeal by Fred. Olsen Cruise Lines and found the line responsible for outbreaks of gastric illnesses such as norovirus. Simon O’Loughlin, a specialist international personal injury lawyer at Irwin Mitchell who represents the group of passengers, said: "This Court of Appeal victory will finally give the passengers who suffered illness during and after cruises on the Boudicca cruise ship in 2011 a sense of justice. They booked their trips expecting a relaxing cruise but instead ended up suffering illness often confining them to their cabins for days." In a statement from Fred. Olsen Cruise Lines, the line said that they are "extremely disappointed by the Court’s decision, particularly in light of the permission to appeal the original ruling. "Fred. Olsen believes that it made every reasonable effort, in accordance with its approved ‘Norovirus Outbreak Prevention and Control Plan’, to prevent and contain the virus on board Boudicca. In the original ruling, the Judge deemed Fred. Olsen’s ‘Norovirus Outbreak Prevention and Control Plan’ to be 'an appropriate plan consistent with authoritative advice and with industry standards'." The statement continues: "Fred. Olsen considers outbreak prevention to be of the utmost importance, and ensures that each and every member of its crew is fully conversant with the strict requirements of the Company’s ‘Norovirus Outbreak Prevention and Control Plan’. "Fred. Olsen guests are all made aware of the need to maintain the highest standards of personal hygiene at all times and are educated regularly as to how to prevent the outbreak and spread of the virus on board." Norovirus outbreaks occur when many people are in a small area, including nursing homes, restaurants, hotels, dormitories and cruise ships. For more information, read Norovirus: What You Need to Know.